You’ll be proud to have these rustic metal wine racks on display in your home. A clean and elegant design made from antiqued metal means you’ll have this out on your table or counter for everyone to see. It can hold up to six standard size bottles of wine in a compact space. The rack is free standing so it can easily be relocated or placed just about anywhere in your home. 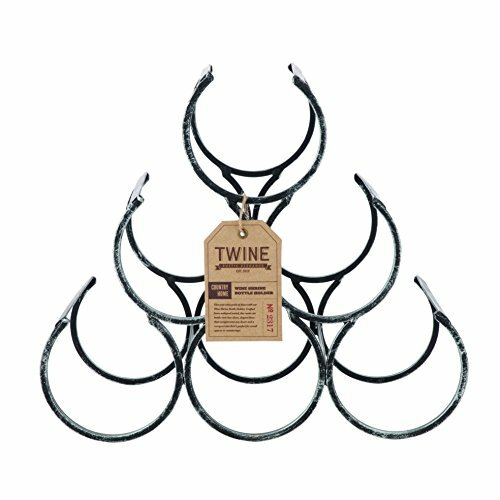 Get your Country Home Wine Shrine Metal Bottle Holder by Twine so you can always have your favorite wines within an arm’s reach. METAL WINE RACK FOR UP TO 6 BOTTLES - This metal wine rack has room for up to six standard bottles of your favorite wine. FREE STANDING DISPLAY - With the wine rack's free standing display, you can place it on a counter top, a table, or anywhere that best suits your home. CLEAN DESIGN - The simple yet elegant design of the wine bottle rack makes it a great display piece that you'll be proud to have out. DURABLE CONSTRUCTION - Being built from metal means this wine rack will look great for many years and withstand lots of use.